MONTMELO, Spain (AP) Daniel Ricciardo made a promising start to Formula One’s preseason by driving his Red Bull to the fastest time and the most laps on the track near Barcelona on Monday. Ricciardo clocked 1 minute, 20.179 seconds before rain and cold track temperatures that dipped below 7 degrees (45 F) kept most cars off the tarmac. The Australian bucked that trend and braved the poor conditions to be the only driver to reach the 100-lap mark. Defending champion Lewis Hamilton managed to get in 25 laps before the weather turned unfavorable after teammate Valtteri Bottas had his turn behind the wheel for Mercedes. Bottas put in the second fastest lap. Kimi Raikkonen of Ferrari and Nico Hulkenberg of Renault were all also within 0.4 seconds of Ricciardo. Last year, Ricciardo proved to be the circuit’s next best driver after the dominant four of Mercedes and Ferrari. He finished fifth overall with one grand prix win in his fifth season with Red Bull. Fernando Alonso, meanwhile, made an inauspicious start after his McLaren lost a wheel and went off the track while it was still dry. Alonso was about to complete his seventh lap when the rear wheel on the right side came off, sending him into the gravel on the final turn at Circuit de Barcelona-Catalunya. The morning session was stopped for only a few minutes. McLaren racing director Eric Boullier said the wheel popped off due to a problem with a wheel nut. ”It cost us track time, the only downside today,” Boullier said. McLaren is hoping to rebound this year after changing to Renault engines following three problem-plagued campaigns with Honda. ”So far, so good,” Boullier said about working with Renault. 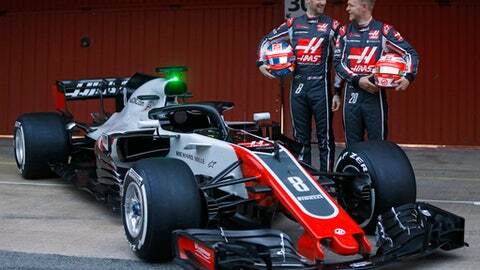 Force India, Toro Rosso, and Haas unveiled new cars before testing began. Toro Rosso, which switched to a Honda-made engine this season, got reliable performances from its car and Brendon Hartley. The New Zealand driver, who got his start in F1 last season, had a steady run with 93 laps. Only Ricciardo beat that with 105. Russian driver Sergey Sirotkin, who is set to debut in F1 with Williams, split the day with Lance Stroll. All the cars sported the mandatory ”halo” cockpit protection, a ring that is meant to shield drivers’ heads. Sebastian Vettel, runner-up to Hamilton last year, is scheduled to drive for Ferrari on Tuesday, when Spain’s weather service forecast colder temperatures and the possibility of snow. Testing in northeastern Spain runs until Thursday. A second four-day session will be held from March 6-9. The season-opening Australian GP is on March 25.